GW’s budget to finance renovation and construction projects has increased by nearly 12 percent for next fiscal year, the Board of Trustees announced Friday. The Board approved the capital budget for fiscal year 2016 on Friday, outlining how much will be spent on new construction and improved facilities on campus. The capital budget increased from fiscal year 2015 by about $14 million to nearly $133 million, but that amount is about a quarter of the size of budgets over the last several fiscal years. The plan accounts for $69 million to be spent on the construction of District House, which will house about 850 sophomores and juniors by fall 2016, as well as renovations to Mitchell and Strong halls. The budget to improve space for academic and research projects like classrooms nearly quadrupled from $17 million this fiscal year to $63 million. That jump includes renovations to Ross Hall, classrooms around campus and the renovations to the Corcoran School of the Arts and Design’s 17th Street building. The University will also invest in research at the Virginia Science and Technology Campus next year. Those funds will continue “the University’s investment in previously approved major capital projects that deliver enhanced facilities in support of the university mission,” read a Friday University release. The capital budget, which peaked at nearly $480 million fiscal year 2013, helped officials finance a years-long building boom on campus. Nearly half of that year’s budget funded projects like the Science and Engineering Hall, the Milken Institute School of Public Health and the GW Museum and Textile Museum, according to a release. Because of the size of those projects, the cost was also spread out over several years. Provost Steven Lerman said in March that the capital budget would likely shrink for this upcoming as officials have checked off those major projects. Experts say that a university’s capital budget tends to change drastically from year to year and depends on new construction going up on campus. Lee Gardner, a senior finance and policy reporter for the Chronicle of Higher Education, said the University’s steady increase in construction over the years has likely been part of a strategy to strengthen the school’s visibility nationwide. The Board of Trustees also approved a $45 million increase to its operating budget, which controls spending for the University’s daily functions. That budget will now total $935 million in fiscal year 2016, an amount that has increased 46 percent since 2012. 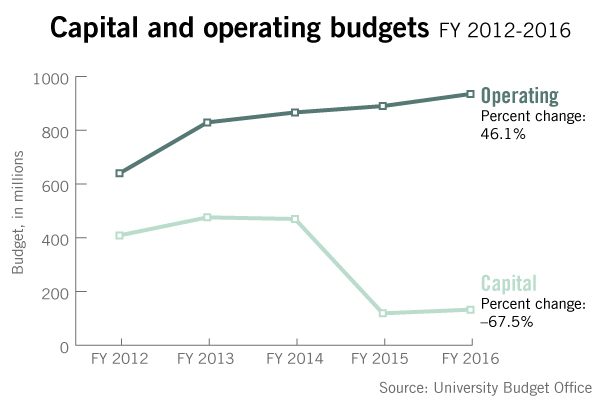 The operating budget also covers a nearly 7 percent increase to undergraduate financial aid for next year. This is also the first year that the operating budget is controlled using a new budget model, which will dictate how tuition revenue is spread among most of GW’s schools.